6.3 quake in Christchurch, NZ, 65 deaths reported | Watts Up With That? Note aftershocks ranging from 5.6 to 4.5 have also been felt in the last few hours. Here is a list of quakes. We wish our Kiwi friends well, and hope that the quake is not as bad as first reports indicate. WELLINGTON, New Zealand — A 6.3-magnitude earthquake Tuesday rocked the southern New Zealand city of Christchurch, collapsing buildings, cracking streets and causing multiple fatalities and serious injuries. The nation’s leader, Prime Minister John Key, said at least 65 had died as a result of the disaster and told reporters in the stricken city that the death toll was expected to rise further. Live video footage showed streets strewn with bricks and shattered concrete. Sidewalks and roads were cracked and split, and hundreds of dazed, screaming and crying residents wandered as sirens blared throughout the city. Bodies were being pulled from rubble. Water mains burst, causing extensive flooding. New Zealand police said in a statement that there were reports of multiple deaths, including a report that two buses had been crushed by falling buildings. The police statement said there were other reports of fires burning. The epicenter of the quake was located in the “worst possible location” for city residents, New Zealand’s GeoNet Center data manager Kevin Fenaughty told the New Zealand Herald. causing multiple fatalities and serious injuries. that the death toll was expected to rise further. wandered as sirens blared throughout the city. mains burst, causing extensive flooding. Taking bets on how long before this is attributed to man-made CO2. I’d guess 3 days to let the horror mature, then they’ll go for it…. Watching the news from the safety of Australia. And having just come back from a holiday in Christchurch only a couple of months back makes it a bit more topical. Looks like its far more severe than the previous earthquake of September 2010 – far shallower and more damage. On the news all day here in Aus. Christchurch stood little chance with this one. September last year there was a 7.1 quake, focal depth ~15km. This one, albeit “smaller”, focal depth was only 5k. So there would have been very strong shaking and liquifaction. The husband of a friend of mine is slap bang right in the middle of the city, he is ok however. Having lived in Wellington, life in a fault zone is an interesting and challenging one when the shakes begin. Not yet, but I am sure it will come. Interestingly enough, I read an article that cliamed the recent solar flares/CME’s were the cause. Here is a isoseismal map of the damage potential care of NZ’s GeoNet. Only 5 km depth is not good. An awful event. Thank goodness our family is ok though my son was in Cathedral Square and his work building was badly damaged. Reports are of lateral acceleration of nearly 1g, attributed to the epicentre being close to the surface. Sad loss of life. Earthquakes are inevitable when they’re living on the edge. I suspect that there will be calls for a review of building standards when the dust settles. There certainly ought to be. Yet more evidence of global warming? OK, let’s be semi serious. We’ve basically won this war, so I’m going to post this despite the possibility it gets taken up by the moronsphere of global warming. The result is that changing temperature on the surface will create stresses in the earth that build up with greater surface temperature change and with longer periods of cooler/hotter climate. To put it in perspective I did a back of the envelope calculation for a 100,000 year cooling/warming cycle, and the rate of crust movement was comparable with “normal” plate tectonics. Recently I replaced some of the central heating pipes with plastic. Ever since then, whenever the heating starts we hear a “creeking” as the pipes begin to expand. The creeking is caused by punctuated expansion. Likewise if the world temperature were changing then you would expect to get similar “creeking”, which would be expressed over a much longer time period due to the much larger system i.e. as a series of earthquakes. Just for fun, let’s examine this further. If the crust of the earth expands due to temperature increase, then that crust can’t just get bigger, part of the crust will be forced down under adjacent plates so that the rocks expand but the total size of the crust remains the same. As many of these rocks will be carbon rich, the result will be to liberate huge quantities of CO2 into the atmosphere (and create oil … but that’s another grand theory) … obviously CO2 causes more warming (wink) so, the rate of warming will increase resulting in further expansion and subduction of crust releasing more CO2. But sooner or later the expansion will stop, the temperature will start to decline (possibly by external forcing such as the earth’s tilt) and then the planet crust will start to shrink. A shrinking crust will cause “gaps” in the crust through which the mantle will come resulting in the expansion of areas like the mid-Atlantic ridge, this will continually fill in the gaps as the crust shrinks until the earth goes back through another warming cycle. Strangely, the rate of movement over e.g. a series of iceages is comparable with normal plate movement. And, it is just possible that the main reason for plate movement is due to a cycle of expansion/contraction of plate due to cyclic temperature changes. Moreover, it is possible that if CO2 were a cooling gas (which it is in part!! ), then the release of CO2 as the crust expands could result in cooling which then drives the cycle into shrinking, allows the reduction in CO2, which then leads to warming, until you have a regular CO2 climate cycle of about 100,000 years, causing the bulk of plate movement. Unfortunately, under such a model, you would expect to see periods of subduction/volcanic release of CO2 interspersed with periods of little volcanic activity and ridge building at expansion zones. And whilst, I’ve not done any research, there’s nothing to suggest it is happening. Of course, it could all be synchronised to other changes, like changes to the earth’s tilt could trigger a change of phase from warming to cooling. … but that doesn’t make it an interesting theory! It’s pretty bad. Here are some photo’s – look at the cathedral in the town square (#40). Living in the North Island, we are removed from the immediate tragedy, but looking at the news, and knowing the Christchurch area, there will sadly be many more added to the death toll over the next few days. Collapsed buildings have simply concertinaed to ground level – hundreds may be inside. NZ TV3 reporting that the final death toll may be 200-400. Grim news to wake up to this morning, and for once a chance to feel grateful for living in the UK, about as far away as possible. NZ, you’re in all our thoughts. Shall be interested to see how long it takes before the echo chamber blames it on “manmade global warming”. It looks to me a lot more like an effect of the weekend’s full moon coupled with the moon’s being very near perigee – strictly gravitational stuff. If lunar cycles are at all responsible here, just wait for new moon on Mar 19th – when there will be an even stronger influence, as perigee proper is roughly bang on the next new moon. This web site shows all the 4800+ quakes that christchurch has experienced since the big one, and still they continue.. Many Australians have either had holidays or worked in New Zealand, and to our very good friends, its times like this, we put aside our sports rivalry and want to pitch in and help in any way we can, its an ANZAC thing, where we have supported each other in war and peace, in troubles and joys as good mates. There are Australian volunteers and professionals heading across to help and our thoughts are with you all. There is a strong bond of affection between our two countries. My home town – though I have almost no family (no immediate family) and have lost contact with all school friends. I went away to university. We grew up with little sense of an earthquake risk. The main fault lines run down the spine of the island, and onto the North Island. Wellington (the capital) is a known high earthquake risk. I understand it was only with the earthquake late last year that it was realised that the city was on a fault. I doubt that building standards would have been as high as in Wellington, so the lack of preparedness will have exacerbated the impact. As Aaron Wildavsky once said, the secret of safety lies in danger. The city sits in the shadow of an old volcanic area (Banks Peninsula) and on an alluvial plain. There has apparently been much liquefaction – the same kind of problem which makes Mexico City very prone to earthquake risk. Yep……. it’s pretty bad……. the footage of the buildings coming down was eerily similar to 9/11 footage. Hope hope for the best and my thoughts are with my friends, workmates and fellow kiwis. I only came back from working there yesterday. I was staying on the 13th floor of an apartment building 1 block from the square, so I count myself lucky. I’m in Auckland, NZ. Far enough away for emotional insulation, but near enough to feel their pain in Christchurch. It’s bad. Someone will bring that up, guaranteed. This is a big hit for NZ. Given the relative sizes of the populations, it’s easily the equivalent of the 9/11 attack for the US. And yet in the UK it’s not on the BBC front pages at all. I finally found a mention of it in the BBC Asia/Pacific pages – just a photo-montage with no comment. Watched on TV, the aftermath of the quake, real time from Melbourne, Australia. Witnessed a woman being rescued from the top storey of a collapsed highrise as her workmates in the street below shouted encoragement and advice. It was quite inspiring to see the way people in the street helped others who were injured or distressed. Australians, of course, will be quick to give support to our friends in New Zealand. Does anyone know the MMS or Mercalli intensity scale readings? Richter scale can be misleading because local conditions can differ considerably especially in shallow earthquakes. Some witnesses have talked of ground liquefaction. Lateral shaking was ~1g and people were thrown off their feet. It sounds like an VIII. Destructive on the Mercalli scale (which tries to capture local conditions qualitatively). VIII means Damage slight in specially designed structures; considerable in ordinary substantial buildings with partial collapse. Damage great in poorly built structures. Fall of chimneys, factory stacks, columns, monuments, walls. Heavy furniture moved.. That equates to 7.0 or more on the Richter scale. Sad prediction – both the Richter scale reading and the death toll will continue to rise. Incredibly grim news. With all the data collected worldwide, a model, any model, which could forecast some warning about earthquakes would be of far more use to humanity than the climate modelling nonsense we hear. There was a 6.4 2011/02/21 10:57:53 south of Fiji Islands, a 5.1 2011/02/21 12:26:34 Solomon Islands, before these earthquakes in Christchurch. There are also earthquakes in the Loyalty Islands. Is there a pattern? As a Kiwi currently living in London I feel helpless due to my inability to do anything practical to help at this distance. Still hopefully waiting on news from relatives and friends who work in the Christchurch CBD. As I’ve spent some happy times in Christchurch, I would like to send all best wishes to those anywhere this dreadful quake. Back in the 1980s my husband and I spent a few weeks at the University in Christchurch and the first night we were there we were woken up by the house swaying like a pendulum because of a minor quake (about 5.6 IIRC with the epicentre a few miles off the coast). Little damage was done that time and we discovered that most of their modern tall buildings are built in virtually separate sections to minimise earthquake damage. In the pictures I’ve seen most of the damage appears to be to the older buildings so it seems their strict building regulations have helped to keep the death toll down. Our prayers are with the people of Christchurch and surrounds. We hope the loss of life is less than the pictures would suggest. Just a coincidence, but it is worth noting. My sympathies & condolences to the people of NZ, many friends who I do not yet know! May the Lord watch over you all in the days ahead. Seismologist says it’s an after shock from the Sept 4th earthquake.I didn’t know that after shocks could happen months later. Bad news : The Christchurch mayor stated in an interview that they have stopped counting the casualties and are concentrating on rescuing the living. That 65 deaths figure will rise unfortunately. I am in Christchurch and experianced the quake, I saw a building collapse and windows popping right in front of me. My power has just come back on but still have no sewerage or water, house is not damaged luckilly. The quake felt worse than the sep 4th quake due to the shallow depth and acceleration 1.5 gravity were recorded in some areas. Theres widespread liquifaction, many roads are damaged, the central area is heavily damaged with lots of buildings down. Some key bridges are closed, power is still out in some areas, theres no fuel left due to panic buying, the roads were grid locked today with people trying to leave the city which made it hard for emergency services and people trying to reach loved ones. The phone networks were also grid locked. There are 65 confirmed dead so far and many still missing, plus a lot of people are injured and in sheltered accommodation i.e. tends or marquees. Will go out tomorrow and try and get out to some of the worst areas and check people are ok etc….subject to being able to get fuel and get there. 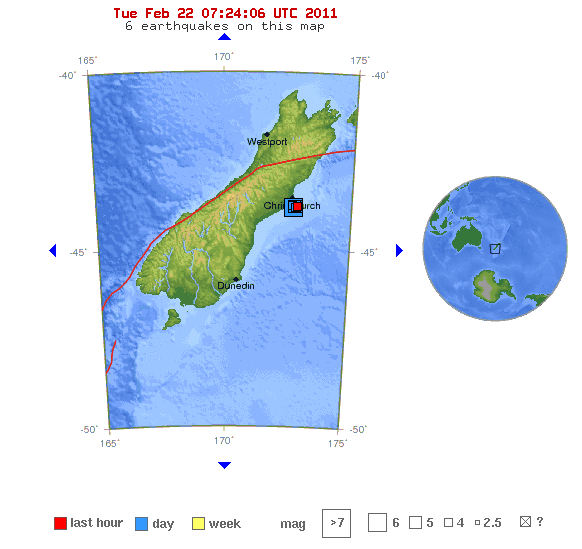 New Zealand, large earthquake on Tuesday, Feb 22. Philippines, volcanic eruption on Monday, Feb 21. I felt it very distinctly in Dunedin, about 360kms to the south of Christchurch. Not quite enough to make me jump under my desk, but it certainly made me put my lunch down. Images on tv are surreal and make the stomach churn just thinking about it. My thoughts are with all those affected, but glad that all my friends up there are safe. It’s much worse than the larger 7.1 quake last year, apparently this one was much more of a sharp jolt. Many older buildings were already weakened by the big quake and 3000-odd aftershocks before today. This one was at lunchtime as opposed to 4:30am. Would be surprised if the death-toll is much less than 200. There’s been about 30 quakes in the last 11 hours, and just to add to the rescue efforts, it’s now raining. Just wait until the HAARP conspiracists get hold of this, again..
My heart goes out to all my Kiwi friends. Our prays are with you tonight. Tomorrow we will all do what little we can to lend a helping hand from afar. New Zealand is not called the “Shaky Isles” for nothing. It has about 14,000 earthquakes every year – though people only actually feel up to 150 of them. The country straddles the boundary of two of the earth’s giant tectonic plates which are constantly grinding together below the surface. It also contains five active volcanic areas. To geologists it is one of the most unstable parts of the globe. To NZ readers and their friends and families – best wishes from Australia. Many people here have direct connections with NZ, and even those who don’t feel a special affection and concern for you. We will help in whatever way we can. There are ~50k Kiwi’s living in London. I think there may be some trouble there about the coverage. After significant events like that of Sept 4th 09, “aftershocks” can persist months, even years after the initial event. The Bulusan event was more of a dome/summit collapse rather than a true eruption. The Philippines is not on the same plate as New Zealand. “Grim news to wake up to this morning, and for once a chance to feel grateful for living in the UK, about as far away as possible. NZ, you’re in all our thoughts. I’ve often considered doing a check between the phase of the tides and earthquakes. I know the surface of the water “buckles” as the earth rotates, so there will be a similar flexing of the earth itself as the gravitational effect of the moon moves around the earth. Obviously that effect will be greatest at full and no-moon, so “on the face of it”, you’d expect there to be some kind of relationship between the “tides” (i.e. the position of the gravitational lump and earthquakes. Obviously, it would depend on the orientation of the fault line and the type of fault because some would be more susceptible to flexing in certain ways – but if there were an increased likelihood of earthquakes at specific times, one would have thought someone would have noticed … so I assume there isn’t?? Having said that, it amazes me how much money goes into the none problem of global warming, and how little goes into real problems, so perhaps it all comes down to a lack of money to research the “unfashionable” problems like earth quakes? Ones heart goes out to the Kiwis again. The USGS states this is an aftershock of the main 7.3 quake in September 2010 but was about 20 miles from town center. This one was only around 3. Fyi, Christchurch is the hometown of Hayley Westerna (Celtic Women). Her web site says her family was not harmed. New Zealand supposedly uses the MMI (Modified Mercali Scale) which is a surface shaking scale rather than the Richter Magnitude scale (total energy). The former is independent of depth and more indicative of violence at the surface. I lived in Southern California for 18 years and never saw any heavy furniture moved. Some I experienced it was difficult to stand up and water sloshed out of my swimming pool but that was about it. Was never over or close to the epicenter of a major quake (6.0+ magnitude) though but 30-50 miles (horizontal) a few times. The earthquake that struck Christchurch has caused millions of tons of ice to break off from New Zealand’s biggest glacier. Tour guides at the Tasman Glacier in the Southern Alps say the quake caused the ice to “calve” from the glacier, forming icebergs in the terminal lake. Tourists of Glacier Explorer boats say the icefall caused waves of up to 3.5 metres in height which swept up and down the lake for 30 minutes. I am a New Zealander living in Haarlem and working in Amsterdam. A colleague gave me the bad news when I arrived at work this morning. I immediately phoned my wife, who turned on the TV and said it reminded her eerily of the feeling we had on a dreadful September day, glued to the TV set and watching the twin towers fall. My wife has checked with our friends in Christchurch, and all are safe. One of my Dutch colleagues is presently on holiday in NZ and was in Christchurch when the quake hit. By text, he tells us he also is safe. Our thoughts are now with those who have died or are injured, and with their families. One of my staff is from Christchurch. We waited today with bated breath for news – thankfully all are safe and accounted for. There are a lot too, being a Maori Family! We’re waiting for news on what they need, and will be taking up a collection to help the family, if required. I’ve been working late analysing the fire alarm data from the quake – in terms of fire alarm activations, that 6.3 quake was 5 times worse than the 7.1 quake in September. Fortunately I’m in Wellington – far enough away not to be impacted by it. The constant aftershocks since September have been upsetting many Christchurch residents – I’ve had one visiting me in Wellington, just to get away from the quakes. Today surgeons had just completed surgery on her knee in Christchurch Hostpital when this new quake struck – the staff had to move her in a groggy state to a newer safer part of the hostpital. how little goes into real problems, so perhaps it all comes down to a lack of money to research the “unfashionable” problems like earth quakes? I think it is more tragic than that… there is a tendency to avoid things not under human control especially if they might be accused of dabbling in astrology… but more than anything they tend avoid anything that can’t be commercially exploited… predicting earthquakes will only save the lives and money of other people… what they want is an earthquake alarm they can sell to everyman and his dog… and when they run out of real ideas they move into fictional science so they can invent some scare that can be commercially exploited like CO2 emissions, BSE, HIV and bird flu. And the last one was 5 months ago. One of the problems living on a dynamic planet. I wish the Kiwis all the best. The UK coverage of the earthquake has been very scant so far. This is a travesty but not an unexpected one. Sad to say, the vultures in media won’t go into a frenzy unless the death toll rises. I hope this doesn’t happen. Although I’m an agnostic I can only say, God be with the Christchurchians. Depends. Chch is built mainly on alluvial deposits which shake more violently in quakes which results in more damage (Liquefaction). The airport at Wellinton will suffer a similar fate, in a similar quake, as will Petone, Lower and Upper Hutt and large expanses of the Wairarapa. In my post @ February 22, 2011 at 3:42 am I meant 2010, not 2009. Would the editors, in the interests of human decency, please suspend arguments about global warming or anything else on this blog at a time of tragedy for many families and residents of a great city? It really is pathetic, sad and demeaning for people to reduce this event to a political pawn in a scientific argument. It is a human tragedy and I respectfully request that Mr Watts and his team issue a firmly worded reminder to their readership advocating that line. As long as he can drag the islands up north using Maui’s hook. @Rhys Jaggar: I guess people are just cynical about the AGW folks, but yes, this is a human tragedy of major proportions. My condolences to those who have lost loved ones in it, and my sympathy to all who have suffered harm. I think I saw a 1.5g estimate! The relationship between Mercalli and Moment Magnitude (the Richter scale requires using a particular, now antique, seismograph) is approximate. The low depth of this quake, only 5 km or so, means that the surface shaking was greater than the 6.3 magnitude would typically be. There are (surprisingly to me) few logs at the USGS “Did You Feel It?” page at http://earthquake.usgs.gov/earthquakes/dyfi/events/us/b0001igm/us/index.html . However, the max logged relative to their Mercalli-like scale was VIII. The few commenters that mentioned AGW all agree with this sentiment. As soon as I saw the news, I came to WUWT knowing that I'd find the most detailed coverage of this tragedy. My heart goes out to all of those who lost loved ones. @Rhys Jaggar, Speaking as someone who grew up in and around Christchurch and still has family and friends living there: The quake and its aftermath is sad, but bigger calamities happen weekly around the world to people who are mostly of no interest to the MSM, and we don’t afford them the same consideration. (5000 brown people dying somewhere unpronouncible is apparently not as important as the recreational activities of Lindsay Lohan). So try to keep your sense of perspective and humour and don’t please don’t demand pious rectitude from others – we kiwis are not so fragile. Not that the Kiwis will probably need any, their metal is well known, but is there a place/link to volunteer or send help? My thoughts and prayers go out to all of the victims of the quakes. Lot of reports in the Aussie MSM of Chch being very cold. Ok, so it is the end of summer. Just got home ( 4 am ) after spending all the time at the PGG building breaking though floors to get to trapped people. Well panckaked, but spaces between beams, surprising number of survivors given the dammage there. Auckland teams relieved locals recently. I didn’t say Kiwis were fragile, I said that making cheap points about global warming wasn’t appropriate. That’s got nothing to do with an earthquake in Kiwiland, Africa, or anywhere else. If next time you’d like me to say: ‘Oh who cares, they aren’t bloody Africans, let ’em all die, this is an opportunity to PLUG GLOBAL WARMING REFUTATIONS’, then fine. If you think what I said was pious, I think you need to drink about 10 pints of beer to return to sanity, mate. God bless you! And all the victims in New Zealand – it looks horrific there. If next time you’d like me to say: ‘Oh who cares, they aren’t bloody Africans, let ‘em all die, this is an opportunity to PLUG GLOBAL WARMING REFUTATIONS’, then fine. ………. Rhys…….try decaf. I agree with your sentiments, but ………dang. You are absolutely right. Will you please make the same point with these people? It is tragic. And we are relieved that Wellington was not hit. John I design and sell metal cutting tools to a company on Lunns Road about 3 miles from downtown Christchurch. We have been selling to them for 12 years or so. A small prayer has been said. Stay as safe as you can. I did read (several decennia ago) a book about sun-earth connections, where earth quakes and volcanic events were described as clusters centering around certain solar events… Not sure if that holds, but magnetic storms may be a good example of such an influence. Anyway, I wish the people of Christchurch much strength in these sad days (was there myself a few years ago: very friendly people, marvellous country!). Sad to see so many deaths. I’ve lived through a few similarly powerful quakes in So.Cal. Seeing the destruction they’re dealing with, I guess I’m now glad our commercial building codes are so stringent. Some people have been wondering whether Warmists will blame the earthquake on global warming. They seem to have started down that track I think. Also keep an eye on Romm, he is a desperate, desperate man indeed. I have friends from the Bay Area (Marin County), who retired to a Ch-ch suburb; she a NZer by birth, and he American. They came through the earlier 7.something ok, but this looks a lot worse. I am trying to determine, if that totally collapsed building that you see in the news videos; which is clearly a multi-storey hotel structure, and not an office building, is the YMCA building. That is where I stayed with my family (one night only) during Christmas/New year, 2006/7 The cathedral that has its Tower collapsed is right on the main city center square. Overall, it looks like it came through fairly well besides the tower. It is all stone construction I believe. Have left messages with friends and family in Auckland for more details; not going to clutter up the Christchurch air waves. You can bet your bottom dollar, that theirs are even moreso. I once worked at the DSIR in the Wellington area; and they were doing building /Earthquake research constantly, and evaluating building designs (with a building analog computer) from all over the world. Very interesting! and I’m glad to see some real research being done that isn’t linked to Anthropogenic Co2 in some form or other. The reason some of us comment here on global warming is because we know our adversaries well. Nothing is beyond these desperate Warmists. We have learned from history. Others will be using the tragedy to promote (C)AGW, which we know here to be essentially a political cause with no trustworthy scientific support for its proposed and already-implemented “solutions.” I showed my respect for New Zealand and her people by noting a thusly political potshot that is expected to come. And I note you got in your own political potshots. Pull of 400nT (~3.6%) on the horizontal component of the Earth’s magnetic field should not be ignored. It may not caused the actual earthquake, but it may caused concentrated energy realise what in the next few months would have been series of minor shocks, there were hundreds in the area since last major quake. The reason some of us comment here on global warming is because we know our adversaries well. Sad, but true. However, we also have people on this thread claiming that it has something to do with the phases of the moon, or solar activity. I would have thought that sitting on a fault line between tectonic plates was a good enough explanation. It would be great if someone (maybe a guest poster on WUWT) could give us a run down on tectonic plates and related issues. My thoughts and very best wishes to all of you on the other side of the ditch. When bodies are being left in the street to focus on the living I would say they need all the help they can get. As an old Kiwi geologist – we were taught about NZ seismic zones and related basement structures – the Akaroa region never featured. I think it is clear now that the Darfield earthquake Sept 4 2010 ushered in a “new seismic zone”. We now know that was wrong. Aftershocks have not died away as in the classic model. So IMHO we are in uncharted waters – shocks look like continuing – for how long we have no idea. The point of view that perhaps Christchurch should not be fully rebuilt where it is – on such a weak substrate – has gained a bit of currency yesterday. I live in New Zealand. I am up in Hamilton so far enough away that I have no worries for myself. I have been watching the news since it happened and I have listened to all that has been said. We are greatful for all the prayers and help that the world is sending us. The Earthquake back in sept 2010 as 7.1 but 33km below the surface this one was 6.3 but only 5km below the surface. It is a tragedy and the worst we have ever had in New Zealand. I have family that live in Christchurch but I am lucky enough that I can say they are safe and unhurt. I feel for all those that have lost people. They have said that 65 are dead but have now changed that to 39 confirmed and identified dead but there are more bodies to identify. Also there are bodies still under buildings and in two buses that were crushed by falling buildings. I do understand why people are making comments about global warming and stuff like that but it is sad that people must think of that at this time when we are still in shock over what has happened. It is a sad time for us Kiwi’s but we are a strong people and we will pull through this. Again thank you for all your prayers and offers of help. Our thoughts and prayers are with our Kiwi friends. “Sad, but true. However, we also have people on this thread claiming that it has something to do with the phases of the moon, or solar activity. It is … if all you want to do is to clear up the mess afterwards. If however like most scientists you want to learn from events like this then you have to be able to step back from the human events and start looking at the science. I’m sorry if that upsets some people, but on the scale of earthquakes if this had happened anywhere where there were coloured people, it would likely have never been mentioned at all! So, basically New Zealanders don’t care a damn, about earthquakes so small … when it happens in Turkey … need I say more? Well Friends in Ch-ch, have reported in all ok. coupla miles from downtown, and folks and house survived. city center seems somewhat destroyed. Well Mike, that is mighty white of you to say so. Frankly, I don’t think you know diddley squat about what New Zealanders think; about anything. So how many hits on that Turkey quake did you get from China; or India, or Brazil; maybe for the United States ? And Mike, as for predicting increased likelihood of quakes (somewhere) based on the tidal variables; that is as old as the hills themselves; and there are folks who routinely report on such likelihoods with excellent batting averages. But evidently you are uninformed on that. Perhaps if you didn’t have such a chip on your shoulder, you would have more time to get informed about such things. Mike, I’d guess the reason there’s few hits in NZ websites for that Turkish earthquake is that it happened in a sparsely populated area in the middle of nowhere with little media apparatus on the ground and poor communications, rather than in a major population centre with plentiful media connections and first-world communications. Mike, I think you would find Kiwis contribute above their weight to disaster recoveries and welfare around the world. We also provide search and rescue over a huge area of the planet – the Pacific Ocean and Pacific Islands down to Antarctica. Not bad for 4.5M people. Come and visit sometime and I think you would enjoy an attitude adjustment. To our Aussie cuzzies, heartfelt thanks, mates. Our building codes are regularly overhauled. New Zealand, along with Japan (another shaky country), is on the bleeding edge of earthquake building engineering research and development, with much co-operation between both countries. Wellington City, where (small) earthquakes are pretty common, was recently (in my lifetime) rebuilt over a period of several decades with older weaker buildings torn down and replaced with buildings engineered, with what we’ve learnt, to much higher standards. I have no doubt our civil engineers will be looking into the wreckage to try and spot the failure modes as several relatively modern buildings have collapsed completely. Christchurch has one of the two largest engineering schools (University of Canterbury) in the country. The experience of this quake will eventually be replicated in the engineering school laboratories with findings and advice being issued automatically, where applicable. This last quake was so shallow, and its epicentre so close, it overwhelmed all standards. However, this is still not the long awaited “Big One.” The boundary between the Pacific and the Australian plates runs down the South Island’s alps—the Trans-Alpine Fault—well to the west of Christchurch. The strain in this fault is continuing to build. When it let’s go, a rebuilt Christchurch may well be flattened once again, as ‘quakes from this fault have passed 8 on the Richter scale in the past. I remember seeing an article in (or around— +/- a year or so) 1998 which, quoting some University of Canterbury geologists, predicted a big South Island ‘quake in 2006 +/- 10 years. This isn’t it, sad to say. Lilacwine – Nah – not a chance that you Aussies would LET us win the Bledisloe – we just have to TAKE it from you! But thanks for the sentiment. BTW we are getting heaps of help from you Aussies, Yanks, Japanese even Singapore – and it is very much appreciated – sure know where your friends are. Even the more modern buildings seem to be under threat now – maybe it’s the liquifaction – it is just like soup – what could stand up when this occurs? The ‘Grand Chancellor’ hotel in Christchurch (about 14 stories) has just been declared unstable and is likely to come down. It is a comparatively modern structure and the reason for the instability is to condition of the ground. I guess this is due to the liquifaction. If I were living down there I think by this point I’d be a bit tired of people jumping up and down about wanting old brick buildings conserved. Historical brick facades (with preservation orders on them) just killed a whole bunch of people. So how many lives are we willing to spend for the sake of architectural nostalgia. Time to rip them all down and rebuild using modern materials. Brick and stone are quite simply insane building materials to use in an earthquake prone country. [—-I’m sorry if that upsets some people, but on the scale of earthquakes if this had happened anywhere where there were coloured people, it would likely have never been mentioned at all! This is supposed to be a forum to discuss things of science – and the most important issues of science are those that can kill 100,000s. Come on there is just a bit of hypocrisy by some people here. Mike. You are entitled to you opinion but may I opine that you know F**** all about New Zealanders or their concern and assistance given WILLINGLY to others in distress in ANY part of the world. AND FYI there has been a very strong bond between N.Zers and the Turks since the beat the S*** out of us off at Gallipoli almost 100 years ago. It is called mutual respect. (We were fighting a war for Britain at the time). Also the death toll which currently stands at around 75 will undoubtedly rise to maybe 3-400 as they find the bodies. But this ain’t a numbers game here – it is about people grieving for the loss of life and a city that is loved. And for your information there has been a continued series of aftershock from the quake that occurred here on September 4th last – literally thousands of them and they will continue to persist over the next few months as well. It ain’t a picnic and it wears the spirit down to be continually bombarded with these things. In a few days – nobody will talk about this on the net but at present we are taking time out to think about our sisters and brothers in Ch.Ch. now and to and wish them well. cretinbob: I don’t have time to look into it now, but it’d be interesting to see how much, if any, loss there has been to glaciers in New Zealand prior to these quakes. Subby may be on to something. I saw one article that said it was the third largest calving of the glacier in 40 years, so there’s been at least two 30 million tonne plus loses. Losing that much ice at once could speed the flow of a glacier or accelerate its demise if it is retreating already. I Googled “Tasman Glacier retreat” and Google added “extreme”. Not a good sign. See the lake in the photos? It wasn’t there in 1973. So there you have it. Global warming is causing earthquakes and earthquakes are causing global warming. No, seriously. A lot of small earthquakes occur as land depressed by glaciers or ice caps rebounds. 60,000,000,000 pounds is a small amount of ice compared to what is vanishing around the world, so a lot of small tremors can be expected in zones where large glaciers or ice caps are melting–i.e, Greenland, bits of the Andes, Switzerland, etc. On the other hand, the loss of big chunks of ice can set a glacier back many yards, which only speeds up the melting in many cases (but not all–the exposed front of the glacier can become a bit more stable at its new location). This is one of several ice and snow-related feedback loops feared by scientists. Sea level rise, change in albedo, warming of ocean uncoverd by ice floe retreat, melting permafrost, etc., are others. Ice and snow are, like other forms of water, extremely volatile–they can build up and retreat in relatively short periods of time. They are also poorly understood. That’s why earlier models used by the IPCC to calculate the likelihood of various degrees of global warming and sea level rise DID NOT INCLUDE THE EFFECTS OF ICE MELTING. A few months ago I commented here, boasting that we had just had a 7.1 magnitude earthquake in Christchurch, which resulted in zero deaths. God I’m sucking in hard thinking about that now:(. The September earthquake had severely damaged a lot of buildings, and this one was a direct hit and very shallow, with a much greater lateral movement, at lunchtime – the result is devastation we cannot believe. Currently 75 confirmed dead, 300 missing and the tallest building in the city about to collapse. Being largely built on a swamp, much of the soil around the city has liquefied, making many more buildings unstable. Christchruch as we know it has gone. Its so so bad down here. It will take years to get over this. And thanks to all the countries who have sent people to help those trapped. Mike Haseler you are so up yourself. You know nothing of us Kiwi’s and you have NO RIGHT to make such comments, How dare you. We are a country of 4.5 million people. We have just had the worst tragedy ever in New Zealand. We have 75 dead and 300 missing. There is a good chance that the 300 missing could be dead. Plus I would like to also point out that for us this earthquake was not o small as you put it. It may have been a 6.3 but with the fact it was only 5km deep it was a massive earthquake. You are a rude and mean person who needs some serious mental help. I hope you never come to New Zealand as people like you are not welcome in our caring and helpful country. Go to hell. A quake of similar magnitude that occured was predicted for the 22nd by a website based on the solar cycle, so there may be something to it??? @ Stumpy which website was that? and are there any predictions for earthquakes in Wellington, New Zealand? A misleading article if you ask me. Wellington CBD would be a concern. Walking down Lambton Quay towards the beehive (Parliament house) you see the markers of the shoreline as it was before the 1840 quake. All the land on the right-hand side of that line was below sea level. Anything built on that land would suffer bad shaking and liquefaction, such as in Christchurch. Kilbirnie, the airport and other suburbs are all built on the, very flat land, that rose in 1840. There are a few building that are set on bearings, the Beehive (Why? ), the BNZ Tower and Te Papa, which you can go down below floor level and see. I expereinced my first quake on the 9th floor of a building on The Terrace in 1995. I then studied the geology of New Zealand and wondered why I’d emigrated LOL. That graph is very spooky indeed. It may well just be a coincidence like the moon/sun subtended angle but it certainly raises the question of “why”. I am so sad for all the folks in Christchurch. I have a question: why would a 6.3 magnitude earthquake have been more damaging than the 7.1 earthquake they had last September? I’m curious. Is it only that the epicenter of the earthquake was somewhat shallower, or is it the fact that the previous earthquake may have weakened some structures enough that they could not withstand this new stress so soon after the September earthquake? One more thing. I note that there was some significant liquefaction. Given that this is a coastal city, has there been a lot of infill over the years that created landmass or is it just the natural terrain tending to be more sandy that close to the coast. I admit ignorance of New Zealand geography. I sure would like to travel to Australia and New Zealand sometime, I hear it’s beautiful there. But this earthquake has given me some second thoughts. And no, I’ve not been to California in over 20 years either, and I have second thoughts about going there, too. Just don’t like being in the wrong place at the wrong time. You can get away with building on sand and silt for a while, but not all that long. Until something that can be cheaply and massively added to the subsoil to prevent liquefaction is developed and deployed, rebuilding in the same locale is suicidal, regardless of “building codes”. Many cities world-wide are similar “disasters waiting to happen”. I live in one: Vancouver, Canada. Much of the south of the city is on Fraser River delta silt. There will be high rises sinking out of site when the overdue “Big One”, or a junior sibling, happens. First, my dip and sincere sympathy is with the families and friends of the unfortunate casualties. To understand what the Earth’s magnetic field was doing, it is important to envisage the GMF components configuration . On this graph http://www.vukcevic.talktalk.net/gms.htm observe values for H= intensity along the geomagnetic meridian, (blue line) with a ‘magnetic jerk’ of 3.6%, and D=declination (red line in degrees) i.e. magnetic meridian moving back and forth by nearly a degree . An ordinary geomagnetic storm (for H down 1%) induces electric currents into lithosphere, as far down as 100 km, electric energy is huge; Dr.S. recons it is equivalent to power of an earthquake of magnitude 7. For this one H was 3.6% down. For time being, to be considered as pure coincidence with the N.Z’s quake. This is the most disturbing discussion I have seen in many months of following Watts Up? Apparently, reasoned argument has swooned in the face of sentimental bullying. Skepticism is nowhere to be seen. Where are the hard questions? I’ve found only a handful of comments on the question of government responsibility for this disaster (even though it is largely economic at this point, as Mike Haseler points out – at the cost of sustaining some nasty personal attacks). What have New Zealand’s governments, civil engineers, and seismic experts been thinking about in the five months since the last earthquake in Christchurch? It looks very much like “boy, we dodged the bullet!”. Someone has posted indignantly that New Zealand is on the leading edge of earthquake zone construction. They just didn’t know enough to expect this earthquake. Oh good! So no one’s at fault, no heads need roll. Or wait! Could it possibly be that, as in the case of the recent disastrous Queensland flooding, an alarm was sounded many years before, and was first buried by government, and then, when eventually leaked to the media, trivialized and ignored? But no, we can’t speak of such possibilities, because that would be “disrespectful” of the dead, the injured and the homeless…Let’s just have some more of the same then. And as for the comparison between popular demand for action on earthquake protection and global warming. As one poster said, there’s no money in warning of earthquake danger (or flood danger, for that matter). True – but much, much more relevant is the huge potential for loss in real estate value and capital investments that could follow a realistic and prudent assessment of earthquake risks in the developed world. Is everyone here, as it appears, selectively blind to this particular bias that happens to fit the picture? How about some hard discussion. If Christchurch’s earthquake risk was so hugely underrated by “leading edge” seismology, let’s identify similar urban areas that might be equally improperly protected. Let’s see whether there truly was unanimity amoung seismic experts on the limited exposure of Christchurch to an earthquake of this magnitude. And if there wasn’t, how the “alarmist” view was received and disposed of. otropogo, a great deal of earthquake strengthening has been done in Christchurch over the years despite the fact that until last September’s earthquake there were no known faults nearer the city than the great South Island alpine fault along the backbone of the island. Since the advent of the first computers in the early 1960’s there has been very extensive and continuous work and research by Canterbury University civil engineers on earthquake risks and structures. This has involved close cooperation and study with all the earthquake prone locations around the Pacific rim. The Canterbury plain consists of alluvial gravels washed down from the Southern Alps and butting up against the hard volcanic rocks of Banks Peninsular and its several major volcanic cone harbours. The huge impact of this earthquake I suspect has been due to its origin immediately adjacent to Christchurch only 5km below these volcanic structures which has generated direct lateral forces like a giant hammer against the alluvial plain basin. The accelerations (forces) of this earthquake were greater by a factor of 2-3 than the 7.1 quake in September. Furthermore, buildings and foundations have been weakened not only by the September earthquake but by the many thousands of aftershocks scattered all over the area under and around the city. Assessments of damage and allocation of repair resources have been unable to keep up with the damage which has been a moving target via major aftershocks. It is pretty easy to ask “hard questions”. A lot harder to provide realistic answers. Some remarkable photos of Christchurch after the quake, see No. 31 especially! I once worked with scientists from the Wool Research Organization of New Zealand in Christchurch (WRONZ), the Kiwis are some of the nicest folk I’ve ever known. How awful….but they are a resilient bunch and will work their way through this. See picture No. 47! Our prayers are with them. Obviously these faults have been dormant for a long time. otropogo will have to look elsewhere for conspiracies to close eyes to danger. In my experience, asking “hard questions” (ie. ones that business, government, realtors, and property owners don’t want to hear), is the most difficult part of the search for truth. First, because one becomes a target as the bearer of bad possibilities, and second, because it’s extremely difficult to get them published or broadcast. This is why I find their scarcity here so disturbing. As for providing “realistic answers”, it may be difficult when hard questions are asked. But when they are not, it’s impossible. When the questions have been asked, and rejected, ignored or trivialized as improbable or “unrelastic”, then one has to ask whether the experts have the strength of character the job requires. You cannot make a Cassandra out of a sheep. Your righteously ruffled feathers seem oddly out of place under the circumstances. You mention the weakening of buildings in the September earthquake – why was nothing done to contain the threat these weakened structures posed? I suggest that a place of worship is a more appropriate venue for such emotional venting. It has been. This is a city of 350,000 people built over the past several centuries. What would you have done? Bombed it flat and rebuilt it all in reinforced concrete in five months? You are being completely ridiculous. There is nothing sentimental in being sane and knowing what you are talking about. You should try it. [Apparently, reasoned argument has swooned in the face of sentimental bullying. Skepticism is nowhere to be seen. Where are the hard questions? I don’t see anything that Mike Haseler has said here that was constructive. He seemed focussed upon NZers not giving a toss about earthquakes happening elsewhere. Nor are you being constructive. I don’t see any sign of reasoned argument coming from your direction. You are already looking to blame the Government otropogo even before the bodies have been recovered. Well bully for you. I will resist drawing the obvious conclusions about that approach at this time. The fact is that NZ has done a lot of research into earthquakes as do all the countries around the Pacific Rim. We have to as they tend to be rather common here. How much should they have done? According to you, it seems enough to have all the answers about this subject so that it could never happen again I suppose. The fact that we did not know that this was going to happen in the way it did does not mean to say that we are complacent or that the government is to blame. Maybe the answer is that a city should never have been built just where Christchurch is. But it was and has been there for 160 years. It has survived many earthquakes over that period and even the 7.3 one on September 4th last was not as damaging as this 6.3 one. Perhaps it should have been rebuilt elsewhere. Well, one does not just move a city like that very easily. This one is different to any that I have ever seen. All the underground infrastructure is severely disrupted as are the roads. The degree and extent of liquefaction is much greater that I have seen before. The obvious damage to large buildings is matched by substantial damage to a large percentage of the small domestic structures, many of which are built of wood as opposed to brick and stone. These are normally more resistant to earthquake damage than the latter. I doubt if we could have foreseen this one coming and even if we did – how would we have got out of it’s way? What would you do otropogo? Shoot the Prime Minister? What have New Zealand’s governments, civil engineers, and seismic experts been thinking about in the five months since the last earthquake in Christchurch? It looks very much like “boy, we dodged the bullet!”. Oh yes and this gem (above) from otropogo. Have you ever seen the extent of earthquake damage babycakes? What do you think the earthquake assessors and engineers were doing since the September 4th event? Why, they were assessing the damage claims caused by that little baby– well in excess of 160,000 of them like 8,000 assessed each week. Cost more or less NZ$7b. They were all sitting on their arses weren’t they babycakes! Get a life. to an unprecedented extent. Many more such extreme events can be expected in the near future. Our thoughts are with you NZ. I was attempting to clear the slate so that some meaningful discussion of the event and the reason for its disastrous effects could take place, including the role of government and of its seismic advisors. I call that constructive. What’s constructive about your hostile rant? “You are already looking to blame the Government otropogo even before the bodies have been recovered”. Oh, do you believe that autopsies of the dead will exonerate the government for its failure to take adequate precautions in the wake of the last earthquake? Seriously, whom would you hold responsible? You suggest the assessors and engineers were working as hard as they could to assess the damage claims. If they’d had their priorities right, and given first attention to securing, demolishing, or cordoning off dangerously weakened structures, many casualties could have been avoided. If they hadn’t enough skilled hands, they should have asked for help from abroad. So Christchurch is “centuries”old (according to Douglas), and 160 years according to you. But I don’t imagine it’s had 350,000 inhabitants anywhere near that long. What on earth would you do in the face of tsunami – gather around the cathedral and pray? The ground moves about every 10-15 minutes still (a bit like a large truck shaking the ground) and a bigger shake about every hour (enough to make you jump and easily enough to knock over older people). The September quake was in the countryside more than 20km away and was deeper, this was under the city and extremely shallow. Many houses barely affected by the September quake are now extensively damaged, especially those on the Port Hills (a ridge of extinct volcanic lava forming a ridge between the city and the harbour at Lyttleton). In September it was the older Victorian era buildings that showed major damage, many have been demolished since then. Many in poorer areas and somewhat rundown with no extra earthquake strengthening largely because of the huge cost this involves. A bit like going bankrupt now to protect assets you will no longer have compared to a disaster when it actually arrives. In hind sight probably a poor decision, but everyone has excellent hind sight. The major difference now is that relatively modern reinforced concrete buildings have been seriously damaged in spite of excellent engineering codes actually adhered to. The codes were essentially calculated on a very large earthquake deep in the ground and about 100km away (the Alpine fault on the plate edges) while this was nearly on the surface and very close (6.3 Richter, VIII on modified Mercalli, 5 km deep and within the built environment). Identification of the dead means nearly all residents will know them or they are a relative of a friend or work colleague (I have 2 so far and counting). This time of summer is also a significant time for tourism in a city popular with tourists. The estimated 20 thought to be in the cathedral and at least some of the 100 in the language college that collapsed (CTV building) are likely to be visitors. We have had rapid and strong responses nationally and internationally to this massive calamity. The next few weeks and months will reveal just how serious the damage is – not just the relatively few buildings we have seen in the news, but widespread through the city, old and modern buildings. The severe underground movement has seriously disrupted services – especially for flushing toilets. I will wait for informed assessment, but believe that neither earthquake occurred at known faults. This is not a case of blaming nature to be able to find no-one at fault, but an example of the awesome forces involved and just how puny we humans are in the face of this force. And to think I migrated here from geologically stable Gondwanaland! In the tsunami from the earthquake in Chile last year, many drove to the beaches to watch it, apparently the same as they did in 1959. No point in gathering around the cathedral, you cannot see the sea from there. In both cases, what actually arrived was insufficient to contribute to the Darwin awards. You can draw your own conclusion from that. Scientists have been warning now for some decades that global warming is having an effect on the earths crustal integrity. Ah, the ‘tell’ of Warmist BS delivery: “Scientists” (some, most, all, unspecified) believe, warn, suspect, suggest bla blah blahh. Horse-pucky, Frankie. Stupid assertions like that one require REEELLLY good backup links, not more “scientists say” bushwah. Otropogo No you weren’t. You were looking for a place to put blame. Read what Warrick says @ Warrick says: February 24, 2011 at 2:23 am. This might put you straight. Yes – good article. Good questions asked – good answers. Warwick, there is no question but that Christchurch will be rebuilt. Seismic analysis says the forces of this quake were nearly double that of present building code design requirements so doubtless they will be raised. Christchurch will be the safest major New Zealand city by the end of reconstruction. the GNS mid-Sept call turned out to be less than perfect. I can see in a lot of GNS and expert statements a desire to sound wise and knowing to Govt and public. Warwick Thanks for the reference. Reading your blog article of 24th Feb I see what you mean. I had (erroneously) thought that the continued aftershocks were all part of the September 4th event. No doubt the building codes will take into account all the information collected from this event when they (eventually) rebuild the city. Hey Warwick, New Zealand was once part of Gondwana, but you fellas went walk-about and left us out here on the collision zone to face all the music! Thankfully we aren’t facing it alone. The support from around the world has been fantastic to see. They are all professionals but you can see that they want to be here to help. I concur with your statement on how little we know about this planet. Events like this really emphasise this point, whilst also highlighting the arrogance of those who claim in another earth-science field that THEY KNOW ALL THERE IS TO KNOW! (Why aren’t I bowing and scraping? (sarc off). As for hidden fault lines, some Aussies will well remember the very real shock of New Castle only 20 or so years ago. Talk about not being prepared. Who knew until it actually happened? I have friends and family in Christchurch. They are all o.k. One a student of engineering at the University of Canterbury, has been evacuated, but to where I don’t know because communication is so limited. Other friends have lost there home and business premises, both were hardly affected back in September. At least they are alive. Douglas, I was simply disgusted that WUWT allowed their forum to become a “send a message of deepest sympathy for the latest disaster”. This to my mind is the whole basis of the global warming scam. 30 years ago, the New Zealand earthquake would hardly have made the news in Scotland, 30 years ago this or that flood, this or that drought, this or that hurricane would hardly have made the news and it certainly wouldn’t have prevented discussion regarding any natural disaster by those who were interested in the science. These days, the news is full of disasters, not because the number or physical severity of the disaster has changed, but because the news media are on these stories like a swarm of flies. Worse, we are all supposed to treat each and every disaster as if we are first hand participants, rather than third hand observers. That is not a reasonable thing to expect. That is bad enough in the Main Stream Media where we expect their profit orientated crocodile tears, but at least I thought we still had a forum like WUWT where we could discuss the science in an amicable way amongst other people who wished to discuss the science, rather than wringing their hands at the latest disaster which has nothing to do with them. That was until the NewZealand Earthquake. Suddenly the whole of humanity(at least white English speaking) is supposed to behave as if it were personally involved in a disaster which on a global scale was being repeated in famine, disease, motor accidents, etc. etc. all over the world in the same day (but in countries and amongst people who don’t access the internet). That still strikes me as totally hypocritical and almost “rent a tear”. As I said, this is the reason why so many people are convinced of global warming … they are being bombarded by natural disasters, being forced by the mainstream media and internet bullying to believe they are personally involved (which I am not) and in attempting to rationalise this increased exposure (rather than risk) and personal involvement, they adopt irrational explanations like global warming to explain why they feal there are more disasters. So, whilst it may seem hard hearted, the only way I personally can help to defeat this man made warming scam, is not to treat each and every disaster as if it is the end of the world for the whole of humanity. But even if one accepts the premise that this is a proper forum for voicing emotional support, and expressions of compassion, there is something dreadfully unhealthy about the lack of global perspective in the current discussion. For instance, in view of the ongoing conflagration in Libya,, which is killing thousands, and promises far worse, it strikes me as obscene that New Zealand is launching a global fundraiser to pay for its relatively picayune economic losses. Thoughtful observers around the world could hardly be faulted for considering this a prime example of rampant ethnocentricity. I wonder, would this fund accept donations from the coffers of the mercenaries being paid by Gaddifi to murder his rebellious subjects by the hundreds? This is NOT the discussion I wanted (or want) ever to see in this forum. And that is precisely why I spoke out earlier against the emotional outpouring that has inundated the usual rational and fact-based debate here. If takes nothing more than some personal link to the issue to lose all sense of scientific detachment and succumb to apologetics, rationalization, and ad hominem attacks on those of differing opinion, the prospects of human survival in the face of a major global catastrophe (such as a sudden onset ice age, for instance) are dim indeed! Surely we can set a better example than this! The Canterbury earthquake phase begun on 4 September 2010 is a stress energy release very typical of the Chatham Rise geological feature extending far to its east. The twisting of the southern South Island – west against its plate impact crumple compression spine (longitudinal Alps) – is what tensions the more porous and brittle Chatham Rise volcanic land mass (extending centrally and latitudinally east) and causes this family of earthquake faults. The energy is transferred by these latitudinal strikes, northwards from here, into north Canterbury and on to the Hikurangi Trough. Ref. Major slip near Kaikoura closes State Highway 1 until next week “The possibility that the slip was caused by earthquakes is not being ruled out” NZTA + SH1, railway near Kaikoura closed until Thursday at best “Heavy rainfall, and not recent earthquake activity, is being blamed for the slip” The Press 12Sept + Sep 15 2010 at 4:15 pm (NZST) Magnitude 3.5, Wednesday, 42.49S 173.82E Focal Depth 5 km, 10 km south-east of Kaikoura, 60 km north-east of Cheviot, 110 km south of Blenheim, 150 km north-east of Christchurch + Sep 15 2010 at 5:01 pm (NZST) Magnitude 4.2, Wednesday, 42.47S 173.75E Focal Depth 11 km, 10 km south-east of Kaikoura, 50 km north-east of Cheviot, 110 km south of Blenheim, 150 km north-east of Christchurch + Sep 15 2010 at 5:38 pm (NZST) Magnitude 4.2, Wednesday, 42.49S 173.76E Focal Depth 10 km, same locale + combination of rain and earthquake confirmed as slip cause RadioNZ News 16Sep10 + 20Oct10 3:15:32AM Magnitude 2.78 Depth 21.47km northeast of Kaikoura. Did not take long for the GW word to be used. Well I doubt C02 caused it, but plenty’s been made commenting on it.